My time has come to write the vaccination post. You know, the one that almost all blogs written by a mother have. Why now? The trigger was a facebook post by a relatively famous person, saying that people who don’t vaccinate their kids are stupid. A huge debate started with people calling each other names instead of engaging in a civilized dialogue. I was not surprised, as I have been following parenting pages for quite a while and I know that the so called “mama wars” escalate quickly. I do understand that when you are sleep-deprived and sacrifice a great part of your personal life to raise another human being, you can get frustrated when people attack the parenting decisions that you oh-so-lovingly made. However, name calling? That I find unacceptable, no matter how much we disagree with each other or how clearly wrong the other person is (eg: “gravity does not exist”). Especially from people who are parents or who work with/around kids, I would expect a much more mature behavior. But I digress. This is not a post about social skills, politeness and respect. Or is it? We, as parents of a 14-month old toddler, feel that vaccinations are important to help maintain not only her health, but also the health of people around her. 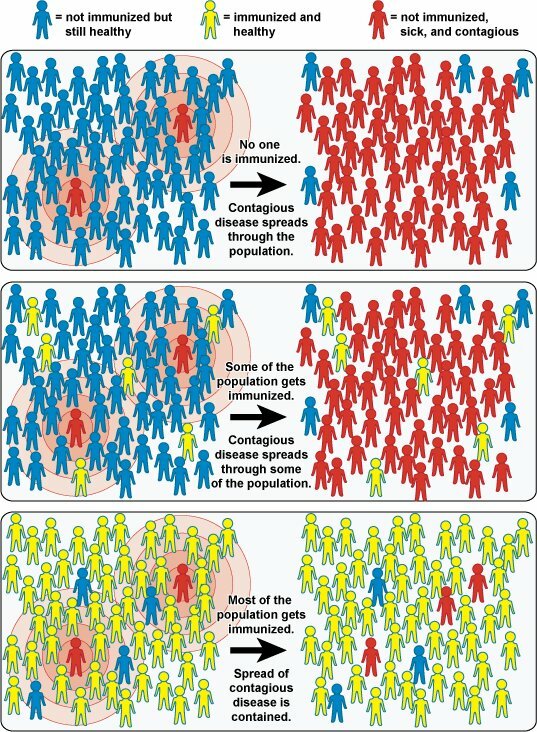 For people who are not familiar with the way vaccines works on the large scale, let me offer a quick explanation of the concept of herd immunity: If the vast majority of the herd is vaccinated, then the few people who get sick from a disease are treated (or die) and the disease can not spread. If, however, a large number of the population is not immunized, then it is much easier for a disease to spread. The image below from wikipedia is a great visual representation. Measles – one in 5,000 children contracting wild measles will develop acute Encephalitis: 3 out of 20 of those children who develop Encephalitis will die from it and 20-40% of those who develop Encephalitis will be left with permanent after-effects. Less than one in a million children who had vaccination will develop Encephalitis from the vaccination which is less than the incidence of all types of Encephalitis. There have been so many articles and blog posts circulating the net about the link of vaccines and autism. Well, that link is now broken for good. The research paper that all these posts have been crediting, by the infamous dr. Andrew Wakefield, has been withdrawn and now new massive research solidifies the knowledge that there is no link between autism spectrum disorders and the MMR vaccine. Here is a link to the study and here is a link to the Forbes article that explains it all. We care because we might have a baby, that might be to young to be immunized and if they come in contact with your sick child, they might actually die, due to their fragile immune system. We also care because there are so many kids out there with chronic diseases that compromise their immune system and for them a flu is enough to kill them. So your child might get away with a fever but these kids won’t be able to fight back. We also care because there are seniors who were never immunized when young and also have a weak defense due to their age. And you guessed it, your kid’s measles might actually kill them. Not to mention that you not vaccinating your kids might normalize this choice among your friends, family and general social circle. Which means that other young parents might believe it is fine not to vaccinate. And they in turn might influence someone else. And that’s how the collapsing of herd immunity happens. So here is where the respect element comes in. If you respect and value the people around you, vaccination is the way to go. Are you saying vaccination should be obligatory? This is a very complicated issue. I do have faith in humanity and I believe that with proper education people should be able to figure out what is the right choice for their families and their community. Therefore, I would say that wide-spread education about vaccinations is a great first step. Education regarding how to conduct valuable and trustworthy internet research is also important. We see way too many people around us trusting websites with urls such as vaccinesarethedevil.com and wakeupthereisonlynetruthandIknowitcauseIamthebest.org. It is important to understand that a blog that someone wrote about their third cousin getting an autoimmune after getting a vaccine and being convinced that this is the vaccine’s side effect is NOT a trustworthy source. Try to look for papers published in medical journals and try to find the most recent ones you can. Read a lot but use your judgment when reading as well. Do you vaccinate your child? Yes, yes we do. Do I like it when she cries when they vaccinate her? Not at all. And I didn’t like it when she had a high fever after one of her vaccinations. And I didn’t like the fact that she had so many before turning one year. However, I like the fact that the Dutch do not over-vaccinate (she will have to go through chickenpox, like I did). And I trust my mother in law, who is a pharmacist and is pro-vaccinating. If you think that she supports vaccines in order to sell them, I should inform you that she was hesitant to vaccinate her own kids and did so only after consulting with pediatricians that followed relevant symposia, to get the most up to date information. But should you trust my story about my mother in law? No, you should go do your own research! But you know big pharma makes tons of buck from selling vaccines, right? So, dear readers, that’s it. My stance is now out there and please feel free to comment on it and/or start a respectful dialogue in the comments section or the facebook page. Please, no name calling. thanks very much – this is a great post, and I couldn’t have put it any better myself.